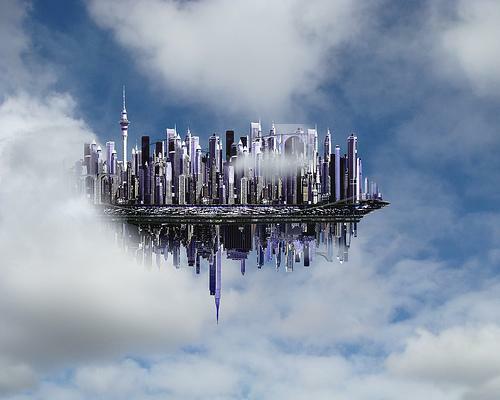 Imagine looking up into the daytime sky and seeing an entire floating city hovering above you. Thousands of cell phone cameras would be immediately whipped out to record such an event, along with a sound track filled with incredible expletives. Within seconds the Internet would be flooded with videos and the news would be heard around the world. Sounds like science fiction? Yes and no. The first part DID happen in 2012, but because it took place over a small impoverished village in Nigeria, the chief and his villagers did not have the technology to record it. 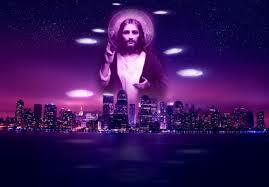 They later told reporters that they weren’t scared but accepted it as a sign from God. What did the villagers really see? Probably a hologram. The U.S. military and NASA have been experimenting with Holographic Projection since 1978 in a program known as Project Blue Beam. While many in the government and mainstream media try to debunk it’s classified existence, its become harder to deny, especially after the Chinese government openly projected a holographic city and alien spaceship into the sky for its own people in Guangzhou. The people were told in advance what the technology was so as not to cause wide spread panic. Consequently, everyone flocked to the area to film it (see video). That event, like the Nigeria one, also took place in 2012. Unlike the Nigeria farmers who saw their floating city in the sky as a heavenly harbinger, the Chinese knew it was nothing but a holographic illusion to be viewed with both delight and marvel. Their government was out in the open about it, but what about the Nigeria sighting? Who projected it? I wondered if there were any U.S. military bases near the Dulali village. Sure enough, Google told me there are two U.S. drone bases nearby. Such bases would provide fertile opportunities for experimentation to see how people might react to holographic events. Holographic projection, also known as “strategic perception management,” can turn the whole sky into a one big LCD screen to beam holograms from multiple space-satellites and aerial drones. Ever wonder why the U.S. has over 1,000 active satellites in space? They’re not just for weather and spying. These satellites have the capability of beaming images off each other to create a 360 degree Disneyland movie theater. Outmoded transparent hologram images have been replaced with holograms that can project full sound, light, heat, and everything needed to make it Hollywood believable. Many countries have been working on this technology for some time. Japan’s National Institute of Advanced Industrial Science and Technology (AIST) developed a device in 2006 which uses lasers to project real three-dimensional images in mid-air. At the demonstration, bursts of laser light were emitted 100 times per second to form shapes in the air up to 50 cm above the device. Heat from the laser caused the air to expand, producing a crackling sound that resembled a series of tiny explosions. This is interesting because the Dulali villagers and the Chinese hologram observers reported hearing “crackling” or “static” sound. This is a dead giveaway that what you are seeing is an illusion. Real UFO experiencers report craft that are eerily SILENT. But, who knows, the military might be perfecting this distinction as well. The March 31, 1997 issue of Defense Week magazine published a fascinating article regarding the U.S. Air Force’s entry into the field of “computer warfare” through the creation of an entire division — unnamed, but whose operating code was given as AF/XOIOW — to be headed by Lt. Col. Jimmy Miyamoto. The new USAF division would be responsible for what the article describes as “futurewar” tactics to include the use of holograms for military purposes. The article described a quasi-computer warfare or psychological warfare operations program initially conceived during the Gulf War for weaponization in space. It stated that holograms of this sort would include the projection of three-dimensional, holographic images as decoys, including “the appearance of an angry God” over the battlefield. The suggestion was made during the Gulf War to project an angry Allah into the sky to command the Iraqis to stop fighting and surrender. The idea was dismissed, but certainly not forgotten. The Defense Week story goes on to say that the Pentagon has openly included the use of such holograms as part of its non-lethal weapons program, but the program vanished from sight around 1994, becoming part of the much written-of “black projects.” In late 1991, the JFK Center and School for Special Warfare appears to have looked into a psy-ops holographic system able to project persuasive messages and three-dimensional images of clouds, smoke, rain, buildings, and even religious figures and images to use as persuasive messages for worldwide applications. Many of the futuristic vehicles of terrestrial origin carry advanced directed energy weapon technologies using broad-band holographic technology to easily ‘cloak’ or conceal and/or present false targets. The lesson here is not to be easily fooled by holographic images in the sky as signs from God—especially wearing the face of Jesus, Allah, or even alien invaders. They are nothing more than tools for manipulation of the masses. Governments are capable of deceit as we all well know. John Lear, a retired airline captain, former Lockheed L-1011 Captain and CIA pilot, as well as the son of the famous inventor of the Lear Jet, believes this technology might also have been used in the World Trade Center attacks of 9/11. Beware of false flag events from those in authority that tell you what is best for you. Stay conscious, cautious, and be aware. These are challenging times as we all search for answers and Truth.